How is Your Latin OF Doing? When is the last time you read the little book of the prophet Jonah? It’s one of the most vivid short stories in the Old Testament, with many colorful and even humorous touches to it (in that regard, rather like the book of Tobit). I think of this book in Lent because Jonah is truly a model for us of God’s grace triumphing over human weakness and sin. Jonah shows us many typical weaknesses: running away from God’s calling; refusing His demands; sleeping instead of staying vigilant; moaning in self-pity; feeling angry with God’s will; having a mean spirit about God’s generosity and mercy towards others. Basically, all the most petty reactions we can have in the face of God are demonstrated by Jonah, and yet God does not give up on him, but keeps pursuing him, keeps giving him the grace to get up again after a fall — the grace of continual, albeit painful, conversion. Jonah’s conversion, moreover, does not go in a straight line from victory to victory, but in a crooked, wavering line, from failure to success to failure again. He is a man who breaks down more than once and seems to be, so to speak, discontented with the role God has assigned him, or the results he gets in his work. He is, in this way, utterly typical of ourselves. We often do not like the role we are assigned in the drama of history. It reminds me of auditioning for plays or musicals in high school. There were only a few really glorious parts you could get, and the rest were scrappy and trivial, like those of Guildenstern and Rosencrantz in Hamlet. We often feel like we’ve been given the scrappy, trivial parts of the drama of life, not the glorious ones in which we flatter ourselves we could really shine with all our talents. Notice, too, how slow Jonah is to get the point. God has not treated him gently. He seizes him, throws him into the ocean, abandons him to a whale’s belly, and then rescues him from the same beast. And yet, after all this, Jonah is still not submissive to God’s will, he still kicks against the goads (cf. Acts 26:14), complaining that the Ninevites will be spared on account of their repentance, complaining that his cherished gourd plant has been wasted by a worm. It reminds one of the Jews who saw the raising of Lazarus and yet still could not put their faith in Jesus, but plotted His death. “Jonah was very happy over the plant” (4:6). Isn’t this just like us, too? Here is Jonah, whose rather dull preaching (at least from the scraps recorded of it) has, by God’s grace, resulted in the repentance and rescue of thousands of souls, feeling very happy about a plant, instead of feeling very happy about Ninevah. Don’t we find ourselves growing attached to little things, and growing upset when they are not available — a certain kind of tea or coffee, a particular schedule for the day, the friendly words of a certain person we like — and forgetting about the immense blessings that Almighty God is pouring out on us and on our neighbors every day? How often do we think about the indwelling of the Most Blessed Trinity in the soul of the just man? If you are in a state of sanctifying grace, the Father, the Son, and the Holy Spirit are making their home within your immortal intellectual soul. You are greater than the greatest temple built by human hands. Now: what was that complaint of yours? As in the stirring poem The Hound of Heaven by Francis Thompson, God relentlessly pursues Jonah because He loves him and knows that he can actually change, or better, be changed. God will not let Jonah’s limited personality, his flaws, his disobedience, get the better of him, be the final word on his tombstone. No, in some sense Jonah is going to be a saint in spite of himself, because God is the one who accomplishes this work in us. As we read in the Psalms, “It is He who made us, not we ourselves” (Ps 99:3). Men do not make themselves saints, it is God who makes men saints. This we must cry out against all the manifest and subtle Pelagianism of our times. Yet there is something required of us — the willingness to be seized by God and shaped by Him, the willingness to be clay in the potter’s hands. Whatever might be said against old Jonah, he finally surrendered to God. Though he grumbled about it, he let the Almighty shape him. The book of Jonah ends with a question; it does not tell us how Jonah answered it. We can presume that God is successful in making his point, and that Jonah, too, is mastered by the divine patience. He learns who God is, and what, therefore, he himself has to be. God has not abandoned him up to this point, and God will not abandon him now. 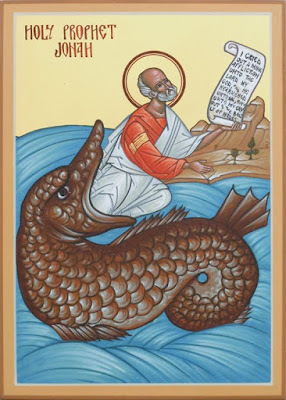 Jonah will become a saint because he is not going to keep himself fixed in a stance of resistance and rebellion, like Lucifer, but is willing to learn and to change. My prayer reached you in your holy temple. Those who worship vain idols forsake the source of mercy. But I, with resounding praise, will sacrifice to you. It was Fr. 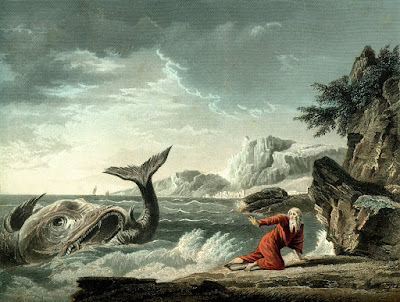 Paul Murray’s book A Journey with Jonah: The Spirituality of Bewilderment (Columba Press, 2002) that first drew my attention to the elements of humor in Jonah. It helped me to realize, moreover, that sometimes a false (puritanical) reverence we bring to the Bible prevents us from seeing the genuine humor present in so many passages.